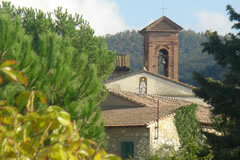 Woodland and olive groves surround the hamlet of Iano in this quiet and unsung corner of Tuscany. 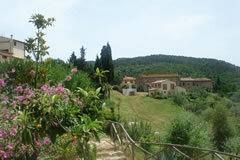 The location is ideal for those who enjoy walking, with footpaths that start from the property. For those who would like an Eco-Tourism vacation we have pheasants, cuckoo, porcupine, hedgehogs and wild boar that roam in our property from time to time we also see a tortoise. 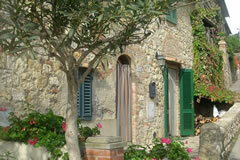 Iano dates back to 1004, Le Monache was built during this period. Le Monache (the Nuns) was a convent of Dominican Nuns or Poor Clares who worked and lived a life of seclution and silence in a Quiet Place. Over the centuries it passed into the hands of the locals who made their own imprint on the building and continued to farm the land. World War II also left its mark Le Monache with its underground tunnels became the hiding place for the Resistance. Today the old road, now paved, which connects us to Volterrra still runs through the hamlet. The nearest historical towns are San Gimignano and Certaldo 20 minutes away , Volterra 30 minutes, Vinci 40 minutes, Florence, Siena and Pisa 1 hour; Lucca 1.5 hours. 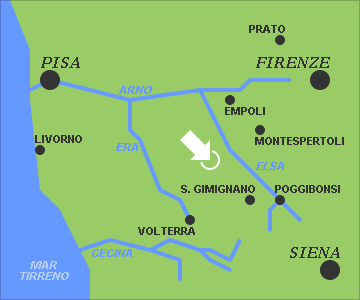 The nearest airport is Pisa 1 hour from Le Monache, Florence airport is also 1 hour away but with less flights. Bologna is also a good choice 2.5 hours away and Rome 3 hours away.